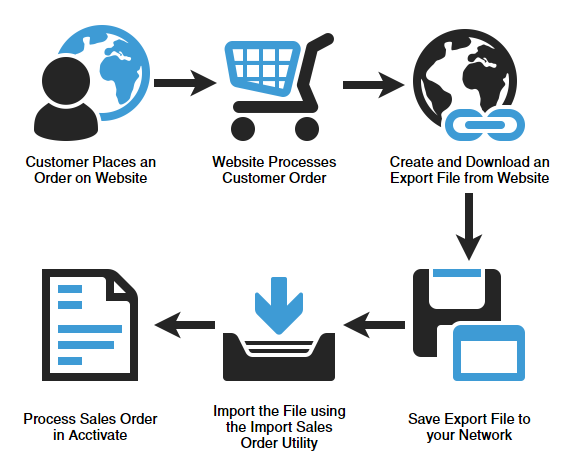 Turn your web orders into Acctivate sales orders by exporting from your shopping cart software. After exporting the file, move this file from your web server to your Acctivate server. This will most likely be done by ftp or an export utility on the website to create a CSV file. Import this file into Acctivate using the Import Sales Order utility. Each order imported will be created as an Acctivate Sales Order to be processed as you would normally. The Import Sales Orders feature is part of the base system, but if you are interested in a more seamless eCommerce integration contact Acctivate Sales at 817-870-1311 for more information about the Web Store Integration optional module.